Inspired by the warm and family-like environment of Le Cordon Bleu, Paula decided to start up her own business, La Cuisine des Amis, to provide cooking classes to people of all ages. Paula Passos was born in Brazil and obtained a degree in Advertising and a Masters in Business Administration. 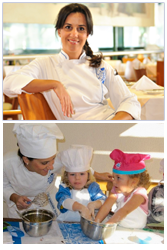 Paula’s relationship with Le Cordon Bleu began during a vacation in Paris in 2008 when she followed a cooking demonstration at the school and fell in love with the place, the Chefs and the friendly atmosphere. She decided to abandon her career, moved to Paris and registered for the Basic level of Cuisine and Pastry Diplomas. Back home in Brazil, Paula took inspiration from the Le Cordon Bleu Paris culinary workshops to develop her own company, La Cuisine des Amis, where she gives cooking lessons to adults and children.